In a different time, at another place, and under other circumstances, you might have run away from Latisha Valenzuela and Glenda Alvarenga. 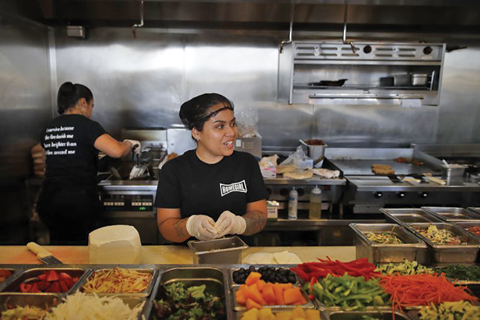 But at Homegirl Cafe, a Los Angeles breakfast and lunch spot with a Latino twist, the two waitresses welcome you with smiles and friendship. “You alone?” Valenzuela asked when I recently visited. “Don’t worry. We’ll keep you company.” After seating me, she tells me, “you’ll want our cinnamon coffee. We make it ourselves.” She says it as if we’ve been friends since middle school. Here, in the City of Angels, Homegirl Cafe offers a unique dining experience with food prepared by former gang members gaining new skills. It’s a haven for them, to be sure. But the popular cafe in the city’s Chinatown is a special place for visitors, too, providing carefully crafted meals along with inspiration from ex- inmates who willingly tell stories about how they are seeking a better life. And where these hands once hurt others, now they are steering their energies to serve pleasurable, satisfying dishes made with love and perseverance. The hip cafe is an offshoot of the Homeboy Industries social enterprises founded by Jesuit priest Greg Boyle. After working in one of the city’s poorest and most gang-plagued regions, he quickly found out that businesses wouldn’t hire former gang members and inmates, even when they had marketable skills. So, he formed nonprofit businesses aimed at giving jobs and training to the “least of these,” as the poor and vulnerable are described in Scripture. He formed Homeboy tortillas, Homeboy bakery and then, Homegirl Cafe. Trainees learn all aspects of culinary arts while developing social skills that create tender encounters with visitors. In addition to job training, the former gang members can take advantage of tattoo removal, anger management classes and drug treatment. Former enemies become friends. Instead of trading gunshots, they shoot playful texts to each other. That tenderness is passed along to customers, who include writers, lawyers, actors and teachers. When a new staffer shows up, “you can tell she’s scared and ready to fight,” Alvarenga told me during my visit. “We make sure we hug her and show nothing but love. Most of the time, they just start crying.” Plates like the chilaquiles – fresh crisp tortilla chips tossed with warm tomatillo salsa, egg, crema fresca, and queso cotija – are made from ingredients that come from urban farms. The Manoy’s, a sandwich made of braised shredded chicken prepared Central American-style with pickled cabbage, onions and mayonnaise, is another unique option. The homegirls can tell you exactly how it’s prepared. In addition to the food are the stories. The story always gets a laugh, but Boyle retells it to highlight the power of kinship, and how a former gang member and an Oscar winner connected in a most unlikely place. Boyle has authored two books, and his inspirational quotes are on T-shirts and fliers around the cafe. To some of the homies, he’s the first person who ever showed them unconditional love without judgment. “Ah man, when Father Boyle walks down the street and into this place … people follow him like Jesus,” said Erika Carlos, a woman who spent eight years in prison who now helps run the gift shop.